LS in Spanish, signed by Ferdinand, "Yo el Rey [I the King]," and by Isabella, "Yo la Reyna [I the Queen]," one page, 8.5 x 6, December 7, 1496. Letter concerning a ban on brocade fabrics, in full (translated): "Dr. Alfonso Ramires de Villaescusa, our municipal royal representative in the town of Valladolid. We have ordered an extension for another two years of the deadline to no longer import or sell brocade in our kingdom, nor to gild or sell gilded things, nor to embroider anything with gold or silver, and the reason for this was proclaimed today in our court. We therefore order that you observe and cause to be observed in that said city what we have ordered and forbidden in our said letters and proclamations, and of necessary, that you have this proclaimed and do not consent that they be violated or infringed in any way, and that you do not do otherwise." 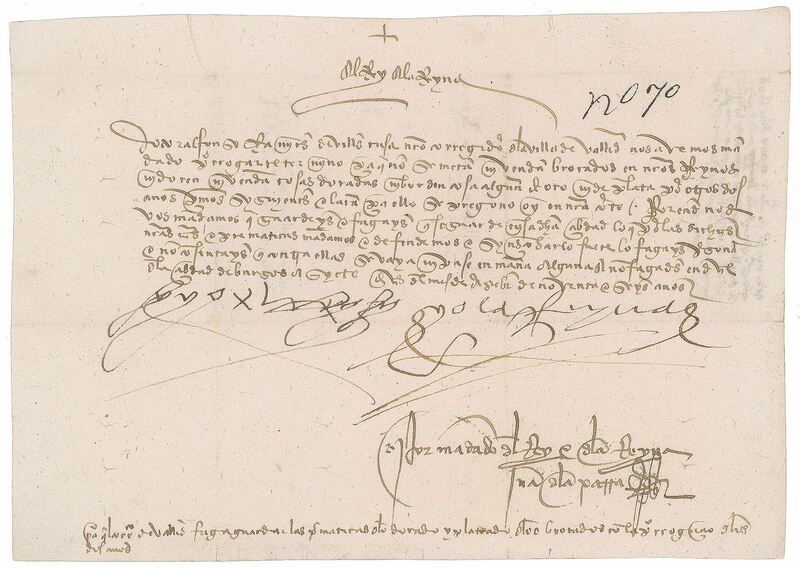 Countersigned in the lower right, "By order of the King and Queen, Juan de la Parra." In fine condition, with intersecting folds and a trimmed top edge. Between 1485 and 1490, Alonso Ramirez de Villaescusa was sent to Toledo as a judge concerning property confiscated by the Inquisition. According to Elvira Viches in the book New World Gold, Queen Isabella banned imported brocade embroidered with thread made of precious metals, worried that her subjects were 'squandering their fortunes, enriching foreign merchants and dissipating the national treasury.' An interesting, exceptionally well-preserved document signed by the famed patrons of Christopher Columbus.